Making our own Easter eggs is a fun activity, especially with children. You should be warned, though, your kitchen will get messy! In addition, don’t expect perfect eggs first time. It can be tricky, but imperfect ones have a charm and the process is fun anyway. Make sure you get lots of good chocolate in to allow for mistakes and the inevitable nibbling. Before you start, make sure that the Easter egg moulds are clean and free of any grease and dust. Wipe them out with kitchen towel or cotton wool. 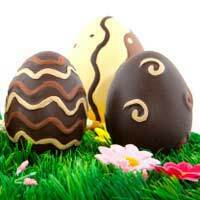 Next, melt down some chocolate – one large bar should make a medium-sized egg. To melt the chocolate, heat some water in a pan so it is hot but not boiling. Place the chocolate in a bowl which can stand in the pan and keep stirring the chocolate with a wooden spoon until it melts smoothly. White and milk chocolate shouldn’t be heated higher than 42ºC, whilst dark chocolate shouldn’t go above 44ºC. Now for the fun part – making the eggs. Spoon some chocolate into one half of the egg mould. Keep turning the mould and fill it right to the top. Then, pour out excess chocolate back into your bowl. This will hollow out your egg. Wipe your palette knife over the top of the mould for a smooth, professional finish. You can now leave the chocolate to set. This should take around 10 minutes in the fridge. You should now wear gloves to avoid marking the set chocolate. Place the mould face down so that the egg comes out. Next comes sticking two halves together. Heat a baking tray in a hot oven for five to ten minutes. Wearing gloves take your egg halves and press them quickly and gently down onto the hot baking tray. You only need to press them long enough to slightly melt the egg edges so that they will set. Don’t forget if you want to add little bags of sweets or another gift, now’s the time to drop them in. Push the egg halves gently together and hold them in place until they set. Make sure the join is completely stuck.